Olá! Continuing to travel through the roots of Portuguese traditional embroidery we have to leave mainland Portugal towards an archipelago in the Atlantic Ocean. 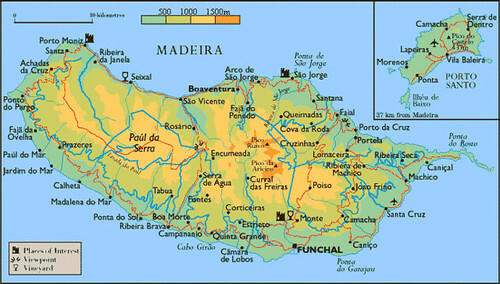 Madeira appears in a map for the first time in 1433. Some years before two Portuguese captains had discovered an island in the Atlantic where they anchored after a storm, they named it Porto Santo (Holly Harbor). One year later was the time for the arrival at Madeira, that means “wood” in English. Linen Madeira Embroidery, photo from an antiques blog. The history of Madeira embroidery began with the first settlers on the island. Soon after their discovery the islands received the first inhabitants and their first embroiderers, too. The captains that first arrived at Madeira brought their families to live with them on the island and many other noble families followed. 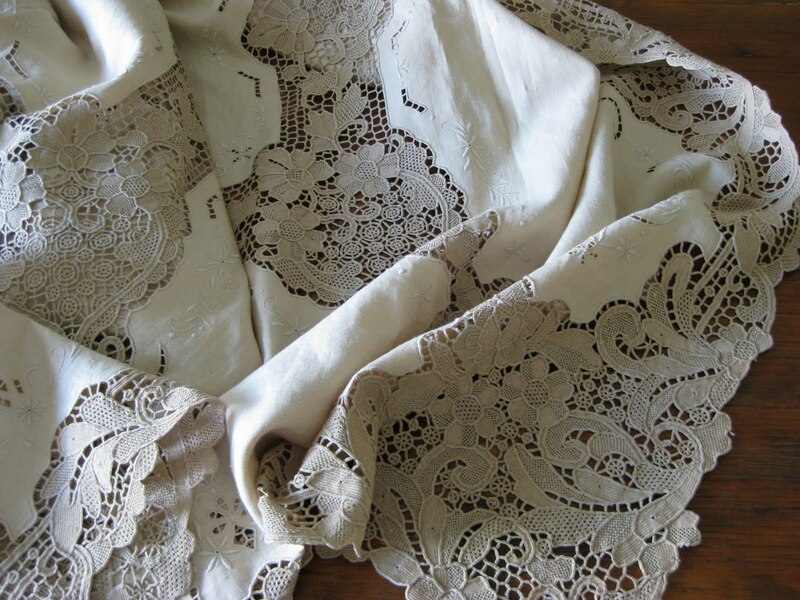 Fulfiling the need for the decoration of household linens as well as of clothing, noblewomen embroidered in their homes and nuns embroidering in convents were also known for their handcrafted work. Most of the women that first arrived came from the North of Portugal, and many specifically from Viana do Castelo region, bringing with them the ancient tradition of embroidery and great skills. This art soon spread to almost all women of the island, even to those living in remote rural areas of the interior. Women embroidered for own enjoyment or as gifts for their relatives and friends. For the young woman, the tradition of the wedding trousseau was very often the reason for such patient dedication to needlework. Embroidery pieces were passed from generation to generation not only for their great sentimental value but also for the richness of the embroidery. 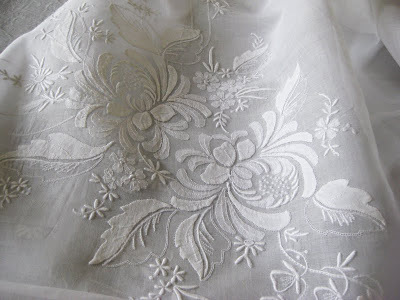 Organdy Madeira Embroidery, photo from an antiques blog. Although following the tradition, we can say that Madeira Embroidery is more exuberant than other Portuguese regional embroideries maybe owing it to the natural exuberance of the island that surely inspired embroiderers. 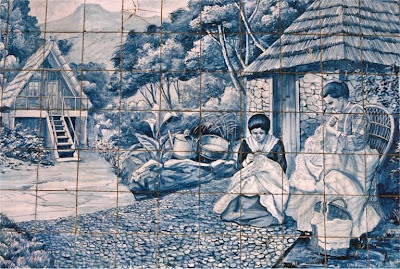 Ceramic Tile representing Madeira emboiderers, poto from this blog.